More Appointments - Adventures with the Tuleys! – 2 hour testing with neuropsychologist (Josiah was tested while Nathan and I waited in the waiting room.) We will discuss the results July 26. – Josiah saw his endocrinologist. His thyroid levels were taken on Tuesday and results showed it was low, so his thyroid medication was increased. He will have his levels tested again in 6 weeks. – Growth hormone was also discussed. It needed to be approved by insurance, so nothing was done at the appointment itself. Insurance has approved it; the hormone and all supplies that are needed will be shipped to our house next week. We are waiting for a nurse to call us to schedule a time to come to our home and show us how to administer the shots. 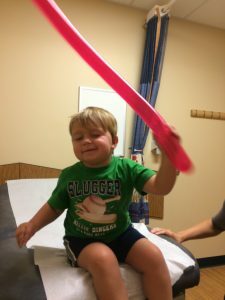 – Josiah had a hearing test and ENT visit. Josiah’s right ear has been draining a thick, dark fluid, and he was able to get an appointment right away. We hadn’t planned on having to be in Columbia today, but I’m glad they got him in. The doctor wasn’t able to see his tube, but based on his history and hearing test, the ear is infected or has a lot of fluid. Thankfully, she didn’t try to dig around and find out. 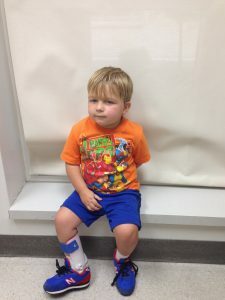 Unfortunately, Josiah is going to have another tube placement surgery towards the end of July. The person scheduling will call us on Monday. This is the second time his right ear has responded this way to the tube coming out. His left ear is doing great and hearing is normal, so nothing will be done there. Awe thanks! He sure loves all the attention!